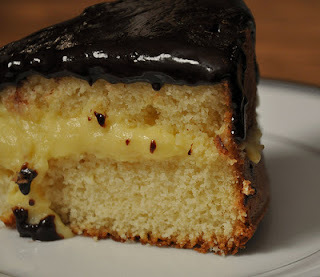 Sweet Sadie's Baking: Boston Cream Pie...Really a cake - not a pie...why? Boston Cream Pie...Really a cake - not a pie...why? According to wikepedia...A Boston cream pie is a cake that is filled with a custard or cream filling and frosted with chocolate. Although it is called a Boston cream pie, it is in fact a cake, and not a pie. It was created by Armenian-French chef M. Sanzian at Boston's Parker House Hotel in 1856. This month I am taking part in the Avid Baker's Challenge, or ABC, a monthly baking group. 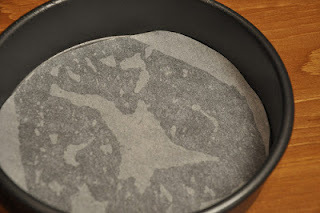 We are going to make a trip to the oven each month with a King Arthur Flour recipe. Take a look at the King Arthur Flour blog for how they did this recipe....I did it a little differently and I made my own pastry cream. If you can, make your own pastry cream- It is worth it! In the bowl of an electric mixer fitted with a paddle attachment, beat the egg yolks and sugar on medium high speed for about three minutes, until the mixture is light yellow and falls back into a bowl in a ribbon. On low speed, beat in the cornstarch. Bring the milk to a boil in a large saucepan and, with the mixer on low, slowly pour into the egg mixture. Then pour the mixture back into the saucepan. Cook over medium heat stirring constantly with a whisk or a spoon until the mixture is thick about 10 minutes. Bring to a boil and cook on low heat 2 to 3 more minutes. Remove from heat, mix in the butter, vanilla extract and Brandy and strain into a large bowl or pan. Place plastic wrap directly on the custard and refrigerate until called. 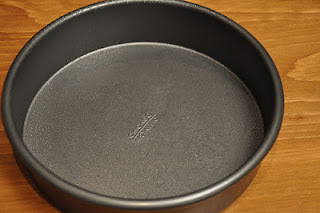 I need to tell you about this fabulous baking pan I bought- Chicago Metallic. It has straight sides and bakes everything beautifully. To prepare the pan, spray it with oil and lay parchment on the bottom, then spray again, It will release from the pan easily! Enjoy this pie..ummmm.cake. Camera Guy gobbled it up! Looks great - and the Cointreau in the pastry cream is a nice touch. Looks great! I am definitely trying your pastry cream recipe. Yep, pastry cream needs booze, whether it's rum or cointreau or.. Nice looks! Welcome to ABC, Penny! Great job on the cake and the pastry cream. I too love those Chicago Metallic pans (I have 2). I didn't think to measure them to see if they're 2" high so I used a spring form pan for my cake. Boozey pastry cream...gotta love that! Your cake looks wonderful! Your cake looks great! It looks so much moister than mine turned out. Thank you for sharing it with us. Thanks for sharing this yummy recipe of Calico Fruit Refrigerator Cookies.This can be preserved for the long period of time that what I needed as most if the time I dont get time to eat those due to my dear daughter.